By tapping into world-leading research expertise at Canada’s colleges and universities, SOSCIP makes it easy for companies to access the latest in advanced computational, AI and data science technologies, as well as the talent needed to sustain long-term growth. With SOSCIP, you get access to Canada’s most powerful advanced computing platforms, expert technical support, dedicated funding for post-doctoral fellows and graduate students, and access to SOSCIP’s partnership network. SOSCIP supports collaborative R&D projects that involve academic and industry researchers working together to solve challenging problems using SOSCIP’s computing platforms. Read our impact stories to find out more. #Here4U Military Edition: Can AI help reduce mental health stigma for the military? 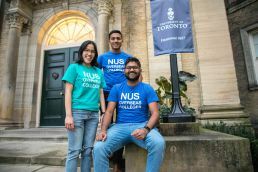 The wheels are already turning on a new “international entrepreneurship highway” linking the University of Toronto and the National University of Singapore (NUS). Modern data science emerged in tech, from optimizing Google search rankings and LinkedIn recommendations to influencing the headlines Buzzfeed editors run. But it’s poised to transform all sectors, from retail, telecommunications, and agriculture to health, trucking, and the penal system. 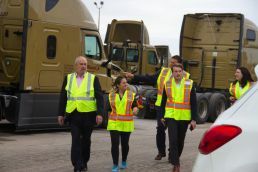 A couple of weeks ago, Foreign Affairs Minister Chrystia Freeland took a tour of trucking company Bison Transport’s headquarters in Winnipeg. With media cameras flashing and yellow safety vest donned, she checked out a truck driving simulator and sat down with a few drivers to get their take on the reality of hauling freight in North America.